A tale of 2 passengers - the person sitting next to me on my Mango flight was a brandy lover who had to buy castle to drink (Mango doesn't serve spirits) and spent the rest of the flight moaning about it, whilst my British Airways neighbour was a whisky drinker who knocked back 6 (for free) during the 2 hour flight, and spoke about whether he should get his kid an iPad. Mid-May my husband made last minute plans for me to join him in Durban for the weekend - Cape Town to Durban on British Airways, and the return flight on Mango - and as travel agents tend to do, I decided to take a few airline notes while I was going about it. He was already upcountry, so I mentally prepped myself for the boring two-hour-plus trip between Cape Town and Durban. Now, a comparison between Comair British Airways (a full-service carrier) and Mango (a no-frills airline) may be a little unfair, but without it how does one decide who to fly with, and considering that we paid R100 more for my Mango flight than for my peak-time Friday BA flight to Durban, I think that some consumer commentary isn't too unwarranted. Once we got going the BA flight was enjoyable and far better than the Mango flight, but more about that later. When I checked in with BA there were only friendship seats (middle seats) remaining, so I just asked to be placed closest to the front and held thumbs for nice neighbours. We were left queuing at the gate for at least 30 minutes before a couple of ground staff came round to tell us that "the flight is technical". Apparently some oil had been spotted on some carpet and some part was urgently required, and if said part could be located we'd "only" be delayed by an hour. They made the announcement on the loudspeaker that our flight was delayed, but oddly we were called to board 5 minutes thereafter, and the plane took off. Soon after we levelled we were served an absolutely sumptuous dinner - I opted for the couscous salad and spinach & feta cannelloni. It was around this time that I forgave British Airways for my sore back and wasted time. The guy next to me was on his fifth whiskey and (he declined the meal) there was absolute silence in the aeroplane as we all sat eating. There was a definite sense of camaraderie that the dinner time provided. After dinner Mark ordered his sixth whiskey (is this why BA flights cost more!) and I ordered a coffee. I finally had time to get bored so I took out my iPad for a little Angry Birds...which spurred Mark on my right to ask me for some advice on whether to get his 18-year old daughter an iPad and we got into a very lengthy (probably whiskey-driven) conversation about technology, Dubai, Cape Town, married life and kids. The conversation lasted until the plane landed, and with just slightly raised voices we could hear one another perfectly well throughout the landing. Everyone filed neatly out of the plane as if we had rehearsed it, and after a surprisingly short trot to the carousels our bags were already there waiting for us. Every other time I've landed at King Shaka I've spent at least 6 minutes walking down that very long passage (though I'm not sure this is due to BA's negotiations, I thought it was interesting that we got the closest parking spot!). All in all, my flight with BA had been pleasant and quick - which is much more than I could say for the trip back with Mango that Sunday evening. The best part of the latter flight was getting an aisle seat even though I arrived at King Shaka for check in very behind schedule. We boarded the Mango plane promptly but I was seated next to a very dodgy looking guy who spent the whole flight speaking to me about his love of alcohol - I was a bit disturbed by this and tried hard to look very absorbed reading a recipe book (the only thing I could find in my handbag). When the airhostess came round to take orders, my neighbour asked for a brandy. She nicely informed him that Mango no longer serves spirits, so he asked what alcohol they could offer him, to which she replied wine or beer. This was the second-best part of the flight. He said he'd have a Peroni, and with a super confused look on her face she asked him to repeat himself. He did, and she replied, "Polony? We don't serve polony, sorry". It turns out Mango doesn't serve Peroni either so he had to make do with a can of Castle, which didn't charm him much (I didn't hear the end of it). I on the other hand had to make do with a R9 cup of awful-tasting coffee. It was very lucky that I found R20 in my wallet because I generally only pay by card; more lucky was that I managed to find the Mango menu in their in-flight magazine (you'd swear they had tried to hide it). When I went to the bathroom I took my handbag and iPad with me, trying very hard not to look paranoid - I just didn't feel safe leaving them under my seat. I spent the rest of the flight listening to how my neighbour needed a brandy (compared to the BA flight where I spent my time watching my neighbour drink 6 whiskies) and counting whether each seat was equipped with a life vest dispenser. If you examine the floor carpeting it looks like Mango put in an extra row of chairs - that each row was originally designed to seat 5 and not 6. Ever seen a passenger get out a bible during the landing ? Apparently my neighbour wasn't the only one with a penchant for mile-high drinking. I was convinced that our pilot was drunk (and not in a Kulula humour type of way). I've never experienced such a bumpy flight in my life, and the weather was perfectly conducive to a smooth flight. In addition to this we took about 2h15m to get from Durban to Cape Town. The descent had us all tightening our seat belts as we bounced up and down, and the lady diagonally in front of me took out her Bible (I'm not kidding). The landing was horrendous - we were all flung forward, twice, and had to grab onto the seats in front of us. And then, just when I thought that the worst was over, our pilot parked the plane in an industrial-looking area next to the airport where we were collected by a bus. By this point my nerves were absolutely shot. To conclude, I informed my husband that I never want to be put on a Mango flight again. Going forward I will be flying with British Airways, even if it means contending with an oil leak or two - nothing beats not having to worry whether you'll arrive in one piece or not. My greatest sympathies go out to my fellow Mango passengers however - most of them had booked to be on a SAA flight! Write to cheapflights@southafrica.to - we love informing our readers of varied views and experiences. "To start with how can you compare BA with Mango, it's like comparing a harbor boat trip to a 3 days cruise. My wife has never had her feet in an airplane, so on the 4th June I decided to fly to Jhb for the day. At first I was a bit worried, considering its a very compact plane. We were lucky enough to have 3 seats to ourselves to Jhb as well as back to Cpt. The flight attendants was friendly, efficient and helpful. My wife is a hot chocolate fanatic and absolutely loved Mango's. We had a bit of turbulence on our way to Cpt but honestly my wife didn't even had a frown. Mango we'll fly with you anytime." "Having just flown to and from Cape Town to Durban & back on Mango airlines, I cannot concur with the experience of Zuhayra Athene Kajee in your article today. 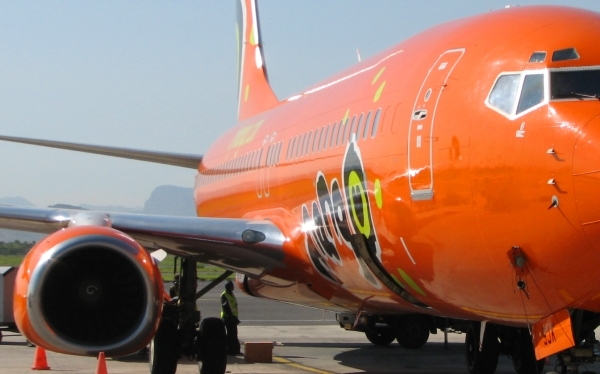 The flights were definitely the cheapest available at R1393 for two Return, fully inclusive. I did feel sorry for those who had paid over R1000 more per leg each via SAA and only got an awful cup of coffee for free in compensation, whereas I had to pay R9 each. However the forward flight was smooth and event free and we landed early. Check in and checkout were better than normally experienced. We managed to get window seats as per our request. The return flight was even quicker for booking in and we got the front seat on the plane next to a window. No-one was interested in drinking and the flight was smooth apart from a bumpy ride on the second half of the home leg, which was attributable to high winds. The pilot cannot be blamed for that, nor can an airline be blamed for the type of person sitting next to you. I was able to enjoy a good breakfast and supper after both flights at a fraction of the cost I would have paid to go on a full service flight, including BA. The forward leg was on a new plane and was comfortable. I flew to USA last month on Etihad airlines, a 5 star airline, and found them more cramped as was the no frills internal flight I took from Denver to Tampa. My seat however on the forward leg was broken in that the lock mechanism did not kick in and I reported it. What was interesting on the return leg was that the passengers in the front section were allowed to board first before the passengers in the back section which created more order. On the Denver flight in USA they follow a similar practice, but not dependant on seating, rather first come first to board in several shifts. The return flight was also comfortable but then I had the front seat so could not compare with the seats further back. Overall the flight was definitely value for money so I guess it’s just the luck of the draw rather than the choice of airline. Thank you Cheapflights for making the flight choices easy. I also booked a car for hire and again opted for the cheapest at R1260 with first car rental for 6 days, no excess, unlimited km, R2000 deposit, (the so called executive package). This was not as good an experience as the Chev Spark which was allocated to me was an old model which took some skilful driving to handle, the first time I have driven a non power assisted steering for a number of years. As small as it was it was difficult to park, requiring some strength. The engine was powerless and noisy. My daughter owns a new Chev Spark which is a dream to drive. I would rather look at taking a more expensive car, as I did in USA, driving some 10,000km plus, than risk this cheaper deal again. The choice system for booking car hire via Cheapflights is not as good as that for booking flights and proved to be quite time consuming in the end." "This past weekend I went to visit my friend who stays in Ellisras, booked flights for the whole family had a good mango flight (CPT – J’burg) there and came back on the last flight for Sunday evening. I stood watching the conveyer as one bag after another came out and to my disappointment one of my bags were left at Johannesburg, this after I had booked my luggage in 3hrs early for the flight. Well what can you do when the gentlemen at the kiosk says to you, sorry these sort of things happen. It was almost 1 in the morning and I had to leave, I got a C number from this gentlemen and was on my way. I live out in Darling, thus I have another hour of travelling to do. I was instructed to phone on Monday morning after 8 to enquire about my luggage. My luggage was indeed delivered on Monday evening to my house in Darling but…… my lock was gone and so was half of the contents of my bag. I was livered. The audacity of some people…. My husband and I had bought each other expensive perfumes for our birthdays (which has just past, 02/06/11) this was gone, along with some night creams, aftershave balm, a set of diamond earings, soap, sprays to mention a couple of things. I have tried to no avail to get into contact with somebody that can actually help me, today is Thursday and I have emailed and phoned but have no luck. This reflects very poorly on Mango airlines and I hope they can get the culprit in their staff before having the Consumer Protection Act on their door."